I have often wondered if foreign ministries follow each other on twitter, and if so, do foreign ministries regard twitter as an important source of information. After all, by monitoring the Ukrainian ministry of foreign affairs’ twitter channel world governments can gather important information regarding events shaping this country’s future as they unfold. Likewise, by monitoring Israel’s official twitter channel, world governments can better understand the Israeli government’s stance on the negotiations with the Palestinians. In order to answer this research question, I have started a project of imagining digital diplomacy activities as a social network. For example, which foreign ministries are most followed by other foreign ministries? Which foreign ministries serve as important hubs of information? 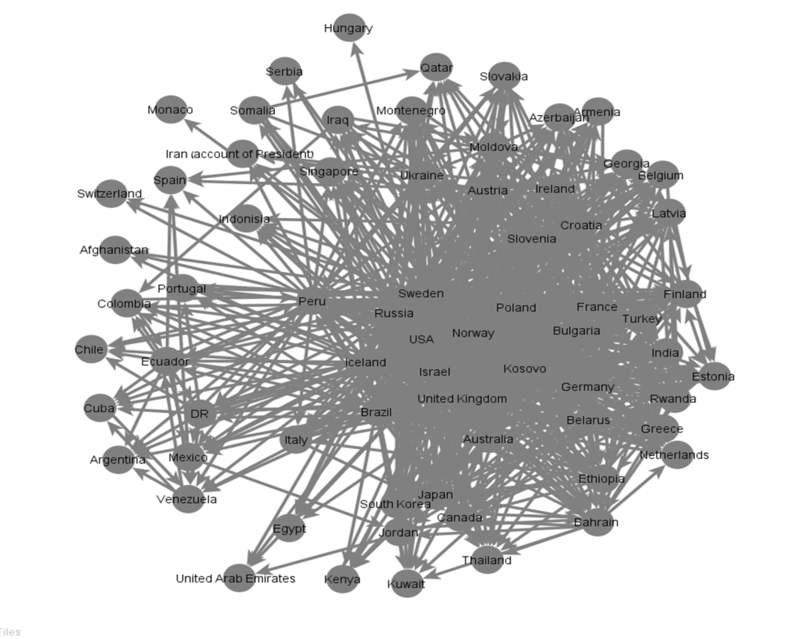 Which foreign ministries are most connected to other ministries?